publicworks.knet.ca - handles community and capital planning and the provision of technical services for member First Nations as a non-profit service. The staff work closely with the First Nations in areas such as housing, development and the management of major and minor capital projects. 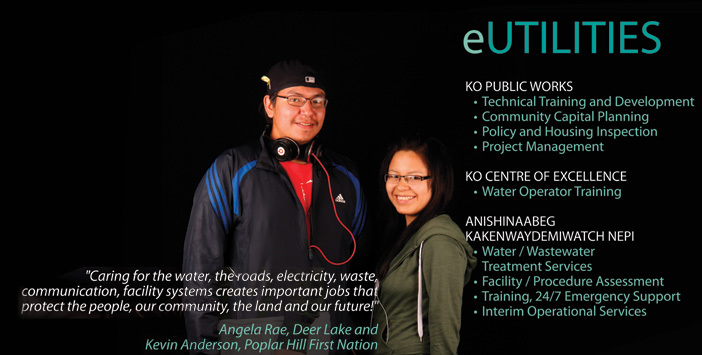 wateroperations.ca - AKN is a water and wastewater service agency operated by and for First Nations in Ontario. We are committed to the transfer of skills at the community level and each of our operational staff is train-the-trainer certified and an experienced training deliverer. watertraining.ca - The delivery of safe potable water to individual community members is a priority for First Nations throughout Canada. The Keewaytinook Centre of Excellence is committed to meet the needs of its clients through the quality delivery of affordable technical and academic training programs. Keewaytinook is your one-stop source for certification courses, academic upgrading and continuing education units. management tools. media.knet.ca - houses all the media that KO publishes online. Photos, videos and knews. knet.ca/info/nativelanguage - Here are some of the On-line resources for Native Language from K-Net Services: Oji-Cree Translation Dictionary, Legends, Syllabic Fonts, Syllabic Keyboard Layouts and Syllabic Table.